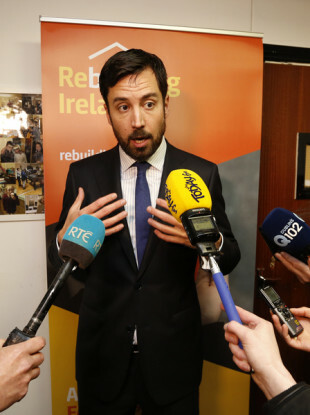 HOUSING MINISTER EOGHAN Murphy has strongly defended himself against accusations that his department was deliberately manipulating homeless figures in order to keep the number of homeless people in Ireland below the 10,000 mark. TheJournal.ie revealed this morning that Louth County Council said in a memo to councillors that it was told by the Housing Department not to include people the council considers homeless in the monthly homelessness figures. Murphy said today that at least half of the 100 households that Louth said it considered homeless, were in fact in secure tenancies and were never homeless. Murphy was speaking on RTÉ’s News at One this afternoon following revelations that the Housing Department confirmed that it had agreed with Louth that up to 100 households not be included in homeless figures. This was despite the accommodation being at least partly paid for through emergency homeless funding. The Louth memo was sent after Murphy announced earlier this week that the number of homeless people in the country was actually lower than previously reported. The Council has since sent out an updated statement this morning, saying that it had agreed with the Housing Department that certain households should not be included in emergency accommodation figures. “Following a number of queries, Louth County Council can confirm it agreed with the Department of Housing that individuals and families who had been accommodated in private houses and apartments leased by the Council should not be classified as residents in Emergency Accommodation,” a spokesperson said. Homeless the charity the Simon Communities said that today that the concern was around different types of emergency accommodation being excluded from homelessness figures. There's a number of different funding steams e.g. Capital Assistance Scheme (https://t.co/5m1m7bDPtX) concern is these households are considered homeless by the local authorities but different types of temporary emergency accommodation are being excluded. Murphy defended himself today following accusations from Sinn Féin housing spokesperson Eoin Ó Broin that he had “directly of knowingly manipulating the figures”. Murphy said that he was right in saying that councils had been miscategorising families as homeless who were not homeless. “I’ve been upfront about this from the beginning of this. Once we discovered that there was a categorisation error happening in some local authorities,” Murphy said. “What we’re talking about here is people that are in homes, families in homes – their own front door their own keys and in some cases they are private rented homes. But they have been counted in our figures as homeless. Murphy said the issue likely came back to a directive he had issued to local authority heads at a housing summit in January. He said that he had told the local authorities at this meeting to focus their efforts of preventing families from becoming homeless. The Minister said that it was his belief that some local authorities had used emergency homeless funding (known as Section 10 funding, after Section 10 of the Housing Act) to prevent families from becoming homeless. “It looks like in some local authorities they used what’s called Section 10 funding – which is emergency homeless funding – to do that, to prevent families ever having to use emergency accommodation or ever becoming homeless,” Murphy said. And as a result of using that funding they then – we think – counted them as homeless when they shouldn’t have. Murphy said that in some cases families may have been facing eviction, but the Council stepped in to pay their landlord while the family searched for a new home (as was the case with Meath County Council). In Louth’s case, he said that Section 10 funding had paid for families to resident in private rental accommodation – so that it was “wrong” to categorise them as homeless. “My understanding is that half of those families that Louth have counted of the 100 are actually in Housing Assistance Payment in that same home,” the minister said. “So it was never temporary, it was never emergency – that is now their residence under the Housing Assistance Payment. They are not in emergency accommodation they are not homeless and it is wrong to count them as homeless. Because that does disservice to our families who are actually in hubs and hotels and B&Bs and who need our support to get them into sustainable tenancies. Sinn Féin housing spokesperson Eoin Ó Broin has disputed Murphy’s statements, however, and today he accused the minister of “directly of knowingly manipulating the figures”. “I am absolutely certain at this point in time that those 600 people were homeless at the time that they were recorded by the relevant county councils,” he said. They are not in tenancies in the private rental sector. They are not in tenancies in council properties. They are in short-term temporary emergency funded arrangements while the relevant councils are trying to move those families with children onto permanent accommodation. Ó Broin said this was so that the number of homeless people recorded in monthly figures remained below the symbolic figure of 10,000. Latest figures for March showed a drop in the number of homeless adults and children in Ireland (with the combined total at 9,681, down from 9,807 in February). This came however with the caveat from the Housing Department that the figures weren’t fully accurate, due to the miscategorisation issue. The numbers had seen a record jump in homeless families in February – and trends showed that the number of homeless people in emergency accommodation would soon have surpassed 10,000. The minister will face question in the Dáil on Tuesday in relation to the homeless figures and the miscategorisation issues. Email “'They never became homeless': Minister defends himself against accusations he manipulated figures”. Feedback on “'They never became homeless': Minister defends himself against accusations he manipulated figures”.